Breathing Cloud can be seen in Zentrum fur International Light Art during 'Down here, up there', an exhibition about the termination of coal mining in the Ruhr area in the context of ‘Kunst und Kohle’. 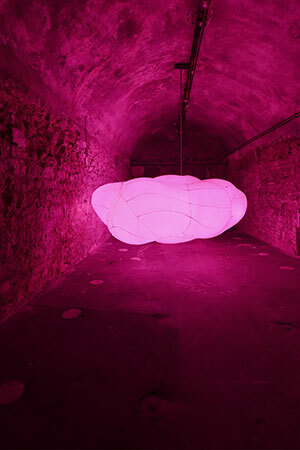 A softly floating, breathing cloud envelops the subterranean space in a pink light. 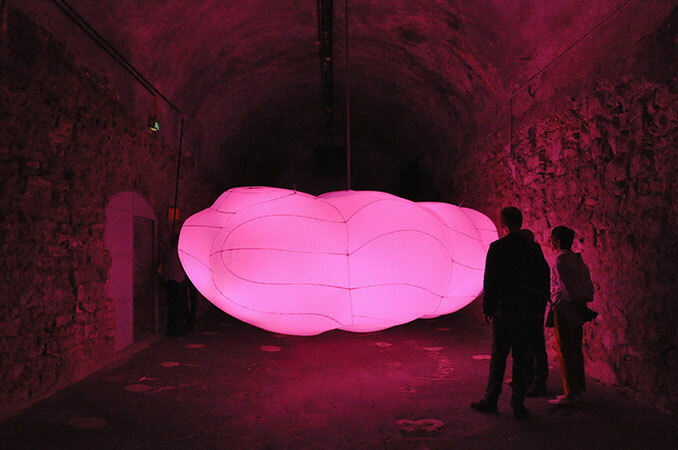 He moves, he breathes and hangs like a cocoon of rest in one of the underground vaults of the International Light Art Museum. Breathing Cloud embodies healthy lungs and new life. In the encounter with the work in its spatial context, contradictions of industry and nature, darkness and light, hectic and tranquility, under and above, come to the surface. These contradictions can in turn be found in the history of mining and in the title 'Down here - Up there' of the exhibition. In the adjacent corridors you can see works by Diana Ramaekers (NL) and Nicola Schrudde (DE). website RuhrunstMuseen - Lichtkunstmuseum Unna. Opening exhibition 6th May 11.00 hrs.